This is the day that you start your new path in life, and you have decided to join that special community–the start-up entrepreneur! You have done all your due-diligence on your new venture; you have prepared yourself for all those long hours and days with the ultimate goal of being a successful business owner and being your own boss. In talking with quite a few very successful entrepreneurs, they are in almost universal agreement–it takes a certain type of individual to take that leap to go on their own, putting aside any fear of failure, and no matter how tough the going gets, always believing there is a light at the end of the tunnel; and they refuse to give up their dream of being a successful entrepreneur, and there is no such thing as giving up and walking away. It can be said in terms of how difficult it is to start a new business in Nevada, there has never been a better time, nor has it been easier. An example would be to look at starting a business say sometime in the 1980’s. It would have been extremely costly. Most new ventures then required a storefront or an office space, advertising expenses, and, in most cases, your reach was limited to the city or region you lived in. Reaching across the country or the world was a very hard thing to do. With all the advances the internet has made just in the past five years, and with the numerous social outlets that are available to you, it has never been easier or more cost-effective to start a new venture, and the whole world can be your client–it’s just a click away! That’s why, with all these new advantages, this just may be the most exciting time to start a new venture. Just think how far business has come in the last twenty-five to thirty years, so for those of us that lived through business in the 1980’s, starting a business, in most cases, meant having a store front or a rented office somewhere, but things have truly changed! Consider all the new innovative companies, apps, gadgets of every shape and form that are now part of our everyday life, it makes one wonder what new and exciting things will become part of our lives in the next ten or twenty years. I’m sure that most of us, at some point in our lives, have had an idea for a new service, product, app, or a business. It takes that rare individual who will risk it all to have their dream of starting a company come true. If this is you, you are well aware of all the hard work, set-backs, frustrations, and long days that will accompany you on your journey to succeed. There are so many areas that new companies are coming on board such as an app developer, craft beer maker and distributor, professional consultant, health care provider, contractor, software design, or one of the hundreds of new products that are coming to the marketplace each and every day, and the one common denominator is owners want protection for their new ventures in case the unthinkable should occur–a claim or a lawsuit filed against it, or, in some cases, their property being destroyed. 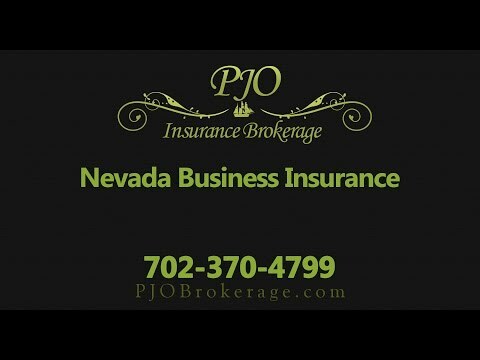 This is where having the proper Nevada business insurance coverage in place when you begin operations can make quite a difference. The first insurance coverage, in many cases, is to acquire General Liability Insurance Coverage in Nevada. Please note that while this coverage is important, it may not cover all of your company’s various risks. Many times new company owners are under the impression that one insurance policy will cover all their company’s potential perils. This is simply not the case. If your new venture is one that will provide professional advice or a service, such as a Consultant, Engineer, Architect, Software or App designer, to name just a few professional areas, having Errors and Omission Insurance in Nevada, along with General Liability Insurance Coverage, could well be helpful to protect your new venture. If your new venture is in the area of a product manufacturer, distributor, manufacturer’s rep, or a retailer, it is extremely important that you have proper Product Liability Insurance Coverage in Nevada as a major piece of your insurance program. In addition, depending on what the risk factor there is with your product, it should make sense to acquire a Nevada Umbrella Liability policy as well. Considering the possibility of your new venture having a claim or lawsuit filed against it regarding one of its products, and there is a good possibility of that happening, your priority should be to have the proper insurance program in place. Here are just a few of the additional coverages your new venture may want to acquire including: Directors & Officers Liability Insurance, Environmental Liability Insurance, Employment Practices Liability Insurance, Cyber Liability Insurance, Inland Marine Insurance, Pollution Liability Insurance, Property Insurance, and Workers’ Compensation Insurance. If you are looking to start a new venture, PJO Insurance Brokerage would consider it an honor to have the opportunity to work with your company concerning its insurance needs.